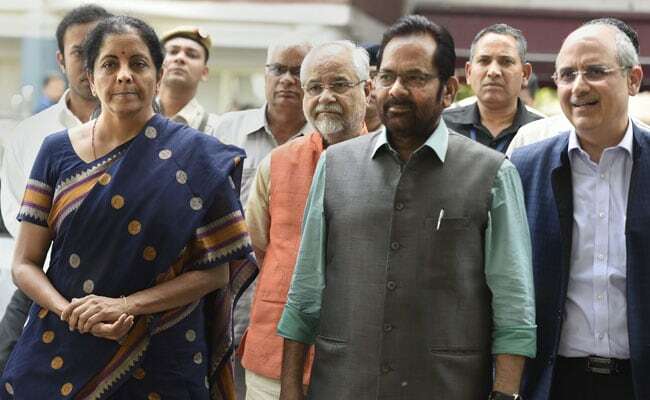 Poll Body Looked Other Way: Nirmala Sitharaman On Rahul Gandhi "Untruths"
A BJP delegation comprising Union Ministers Nirmala Sitharaman and Mukhtar Abbas Naqvi met the Election Commission officials today. A BJP delegation led by Nirmala Sitharaman and Mukhtar Abbas Naqvi met Election Commission officials. The Election Commission is ignoring complaints against Rahul Gandhi, Defence Minister Nirmala Sitharaman alleged on Friday as she accused the Congress president of saying "untrue" things against Prime Minister Narendra Modi amid the ongoing Lok Sabha polls. The BJP approached the Election Commission seeking action against Mr Gandhi accusing him of repeatedly calling PM Modi "a thief" and attributing to the Supreme Court things it did not say in the Rafale fighter jet case. A BJP delegation led by Union Ministers Nirmala Sitharaman and Mukhtar Abbas Naqvi met Election Commission officials and also alleged that the poll body had ignored their earlier complaints against Mr Gandhi on the issue. Earlier in the day, BJP lawmaker Meenakshi Lekhi requested the Supreme Court for criminal contempt action against the Congress president over his comments welcoming the top court order in the Rafale case earlier this week. The order was seen as a setback to the government. "The Congress president is using abusive words and statements that are untrue. He is repeatedly calling the Prime Minister 'chor' without any evidence despite the Supreme Court's December verdict in the Rafale case, and also putting words into the mouth of Supreme Court," Ms Sitharaman told reporters. "We have complained to the EC (Election Commission) that neither the SC (Supreme Court) nor the Comptroller and Auditor General (CAG) have said anything of this kind. But the EC did not take cognisance. It looked the other way," she said.